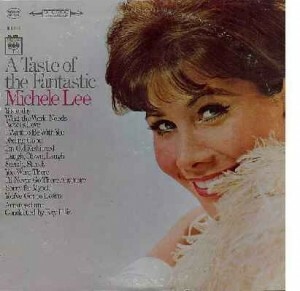 Michele Lee - Call on Dolly! Michele doesn’t remember all the details that led to her starring in Hello, Dolly!, but she does remember that the call came from Lee Roy Reams, who would be directing, and that he wanted her in the role. He certainly knows the play. The thing that Michele loved about Lee Roy was that he gave her time to find her own way and approach to Dolly Levi. If he felt that she was going a little astray after he gave her the freedom, (in astray, she means that if there were certain laughs that were there…), he would nudge her back, but he allowed her to fool around with it, which she loved. Obviously, people who have played her have found the character, as wonderfully eccentric as she is, and there are so many ways of finding that. Again, Michele loved Lee Roy and so did the rest of the company. Michele did draw on her relationship with her former husband, James Farentino, for inspiration in playing Dolly, also, on her relationship with her father. At the time, Farentino, was a living, breathing friend of Michele’s. Michele’s father always believed life was more important than suffering. As Dolly finds with her love of her deceased husband, which she can’t quite let go of, Michele responded to totally. That connection she had with him and the knowledge, ultimately, that she had to let go was really the part of Dolly that Michele responded to most. If she were to play Dolly again, would she do anything differently? She would not know until she began the process all over again. Michele does feel, and she has found in her career, that as time goes by, your “creative fitness” and its adrenaline take over, you do find other aspects of the character through your own experience living life. She might do things differently, but she would need to be in the process itself going from the book, page one. What Michele does, which she finds very necessary, when she is addressing a project she has done before, is to address it as a NEW project as opposed to what she might have done with it before. She announces to everybody that she cannot be disturbed. She reads from page one of whatever she is reading as if she were the audience. Things will pop into her head, things she had forgotten, as she turns each page, and she starts to feel the character and “her” presence on one level. She also starts to see the whole of the piece as the author wished her to see it as the audience. Michele did not see the original cast of Dolly starring Carol Channing. She did see Carol play the role later on. “Come on, there’s no one better than Carol Channing!” She’s so brilliantly special in this role, that Michele certainly went out of her way to do everything Carol didn’t do. Most of the other actresses interviewed for this book have had similar comments. Michele fell totally in love with Dolly. She thinks everyone falls in love with Dolly when they see her. Obviously, there is identification with someone on the outside looking in. Dolly, with all her strengths, at first, is on the outside looking in, because she is trying to live life, but she is really held by her past and Michele identifies with that. She initially fell in love with her when she saw her on stage. When you play her, that arc that Michele is talking about is so wonderfully freeing. Also, Michele loves her zany ability to be able to move things around. Michele identifies with that, as well. There is that part of her that is holding on and won’t quite let go until she can move in a new direction, which she certainly does. It is so special at the end of the show when she is dancing with Horace when she allows her past just to be a part of her heart. If Michele could play any part in Dolly with no restrictions, the role she would want to play is Minnie Fay! All of the roles are so absolutely wonderful. She doesn’t know that she would play Horace. She loves the Minnie Fay character which is so much fun and she keeps gravitating back to that. Cornelius, too, maybe. Walter Charles was Michele’s Horace. “Oh, My God, he was incredible!” They had wonderful communication as actors. They never got into each other’s way. They knew they had “x” amount of time to learn the roles. He had done Dolly before and Michele hadn’t. He was always asking her if she wanted to run lines, which they did often, the speeches are very long. Michele Lee (second from left) were Tiffany Haas, Julie Kotarides, Brian Sears, director Lee Roy Reams and Kristine Reese. 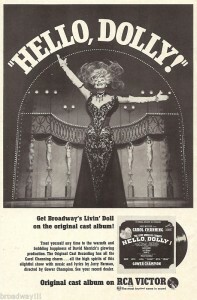 Michele easily considers Hello, Dolly among the top five shows of her career. “The music! Give me a break!! It’s amazing material.”They would look at each other and giggle. He was a “light on the stage.” He was a wonderful Horace. What did Michele bring to the production? “Really good legs!” First of all, she has a voice. Sometimes, people who are playing Dolly don’t necessarily have to have a brilliant voice. Let’s face it. The role is so colorful and so much fun to watch AND act. The music is so divine. If you’re acting it, you’re home free. Michele was able to bring her vocal talent to the role as well as a true connection. Michele does talk to her former husband from the heavens above. That real connection, that vulnerability, and love, for her husband is something she brought to it. Michele continues to tweak her performance after opening in a role and Hello, Dolly was no exception. 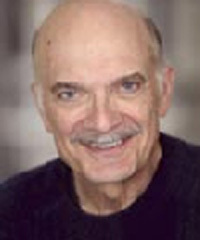 John Scherer was Cornelius Hackl. He was right on the dime. Everyone who was in this production was so wonderfully powerful, talented, and gifted, really good actors. It’s hard for Michele to remember every detail, but what she does remember vividly is how much she loved this cast. 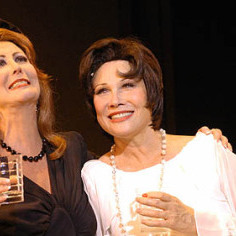 The significant impact of playing Dolly, for Michele, was the fact that this is such a wonderful role for women to play on stage. She wishes there were more roles like this. It is a testament to the workings of our brain when it comes to the memorization process. You think you will never ever get through it. Somehow, it works. It is always sharpening the tools. Dolly is a difficult role in the fact that there is a lot of dialogue. Seeing a woman, especially at that time when people were more reserved, going after what she desired, is a reminder that we can get what we set our minds to. Everything can work out if you go after it. The first day Michele rehearsed with the cast, she knew this was going to be a great production. Other than Carol, Michele also saw Pearl Bailey. “She was a lot of fun. You can’t go wrong with the role.” She didn’t particularly like the connection between Matthau and Streisand in the movie. She has never seen a Dolly that missed the mark. The role is too good. 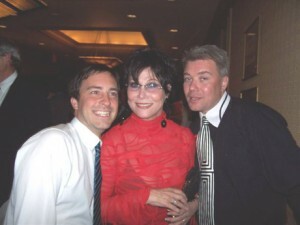 Michele’s thoughts on Jerry Herman are that he is one of the best EVER. She loves him. She had worked with him before. He is a musical genius and she cannot say enough about him. She’s not saying anything new. She has been at his home. He has helped her with songs. She first met Jerry when she was seventeen. She also did Parade in Los Angeles. In was one of the first things she ever did. She fell madly in love with him. He is a very special person to her. When you get married to a cast, and you love what they’re doing, and you’re having so much fun, it’s very difficult to say goodbye. Everyone says, “We’re going to get together”, etc. Some of the people, Michele has seen again, John Scherer, she went backstage after seeing Walter Charles in a play once, Susan Powell. You think you’re going to keep everybody in your life, but you don’t, even if you want to. You fall in love with members of the ensemble. They are so wonderful. Life goes on and you do new things. Michele would love to do Dolly again, if the opportunity presents itself, especially since she mastered holding her head up with those enormous hats. They had to keep redoing some of the hats. The hats and costumes were incredible. The hats, however, were so large, and you have to move and sing and whatever. They have to be balanced in a certain way. They have to be balanced, period. Hello, Dolly reminds Michele of how wonderful musical theater is for our souls and how close we are to losing THAT if we don’t support the brilliant works in our theater. Hello, Dolly is what theater is.